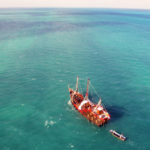 Do you imagine yourself in a pirate ship in Cancun for your dental vacations? Well this childhood dream can come true! 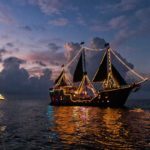 Like the movie of Peter Pan, or Pirates of the Caribbean you can finally sail inside a real pirate Ship with your family while you enjoy some dental vacations. 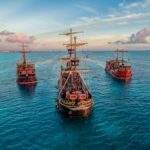 Cancun has in fact many attractions for tourists, many of them are ecological parks, like Xcaret, Xel-Ha, Xplor, Xoximilco, Ventura Park, and today we are to talk about Captain Hook, the best pirate ship you will ever experience! All of our patients always fall in love with the Mexican sea, we recommend them to schedule activities like: Sunbathing in the beach, eating lobster, traveling to the Riviera Maya, driving golf cars around Isla Mujeres, visiting Chankanaab in Cozumel, or taking selfies in Tulum. Plus, you will return back home with a new smile and many stories and pictures to show. This is why the Mexican dental vacations are on top of other countries. Here you can see some photos of the Captain Hook ships below the Calinda Bridge. If you have kids they will also love it! 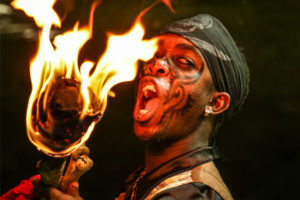 The show is family friendly, you will see amazing pirate battles and at night the chefs serve lobster, fish, steaks and more food, you will enjoy the perfect moment surrounded by the lights of the ships. 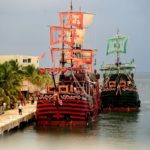 This activity is very popular in Cancun, plus kids love adventures and pirate stories. 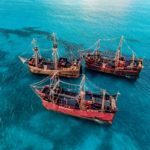 The pirates guide tourists inside the ship, then the boat sail between the sea of Cancun and Isla Mujeres. You will experience a furious battle when a second pirate ship approaches the boat where you are. At the end of the battle a winner will emerge, after the performance you will get delicious food like crabs, shrimp, lobster or a steak. This is an incredible experience that happens only once in a lifetime and that you cannot find anywhere. Cancun is the best place to find great tours, aquatic and eco-tourist parks like Crococun or Xcaret. As you can see in Cancun, you can have a dental procedure and also you can have vacations! What are you waiting for to have an amazing Mexican dental vacation in Cancun?